It’s Monday and I want cookies. Maybe some ice cream to smoosh inside. Sadly, I made these cookies almost a week ago and they disappeared pretty quickly…so that seems like as good a reason to share the recipe. These are also egg-free and dairy-free so they’re perfect if you’re allergic or avoiding those things. These are strange little cookies and you need to be a honey lover to really enjoy these. The honey flavour is well pronounced, so make sure you like the honey you use to bake these up. The honey I used was a strange little Cuban honey produced in Spain. I don’t quite understand the lineage, but the flavour was unlike any other honey I’ve tried – almost like camomile and wild grasses. My husband thought the taste was a bit off, but when I gave him a taste of the honey straight from the jar, it was apparent that the strangeness was all the honeys doing. I liked the honey, but it was a bit weirder than other honey I’ve eaten. I doubled the original recipe to make 22 cookies and I added in some freshly ground nutmeg. I was hoping to replicate those little Greek honey cookies and I think I did alright. 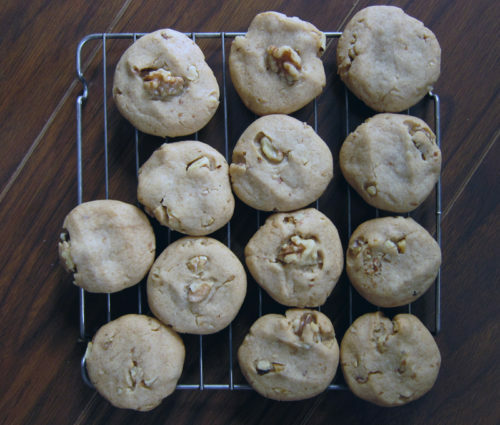 These aren’t a copycat of those Greek spice cookies, but they do have a similar taste and they are dense and chewy, which is so satisfying. The walnuts here are necessary. If you don’t like walnuts, then maybe you should skip this. They gave the cookie a good crunch and on a second batch I pressed a walnut half on top of each cookie for more of that yummy richness. 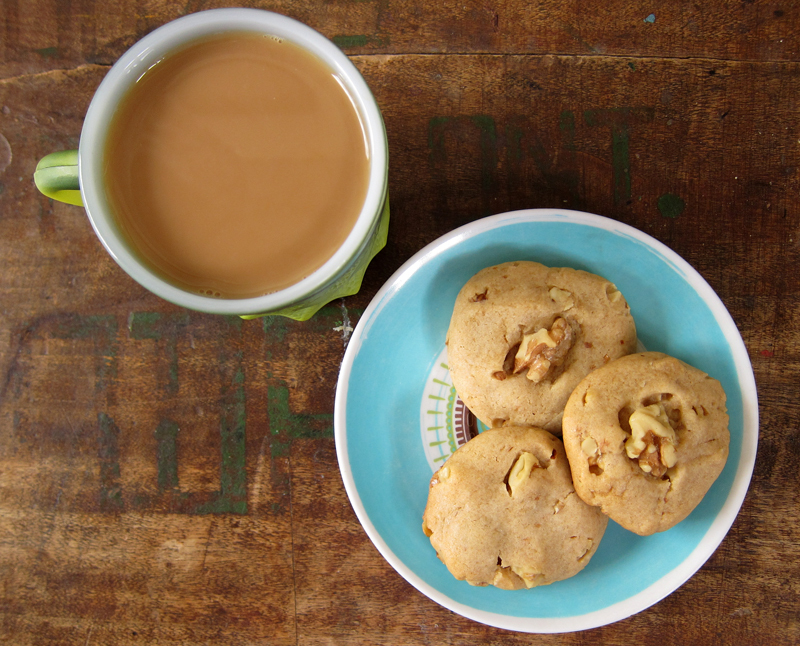 These are unique and delicious and taste best with a strong coffee on a rainy morning. Preheat oven to 350F. Prep baking sheets with parchment paper. In a large bowl, use a fork or a whisk to stir together the flour, baking powder, baking soda, salt and nutmeg. In a smaller bowl, combine brown sugar, oil, honey and vanilla extract. Stir well until everything combines. Pour the wet ingredients into the dry, add in the walnuts when the mixture almost comes together and continue mixing until combined. Use a teaspoon to measure out batter and roll into balls, place on cookie sheet and flatten slightly. Repeat, leaving at least an inch between each cookie (I was able to fit 12 cookies on a sheet). Bake for 10-12 minutes. Remove from oven, let sit for a minute on the sheet before removing to a cooling rack. Makes 22-24 cookies. Mmm, I love chewy cookies, and I love honey! These sound right up my alley! I can understand why these cookies disappeared quickly! I love adding honey to fresh baked cookies; it makes the consistency SO awesome. I didn’t really used to be a honey lover but i’ve recently become obsessed and eat it at least daily on my morning yogurt. 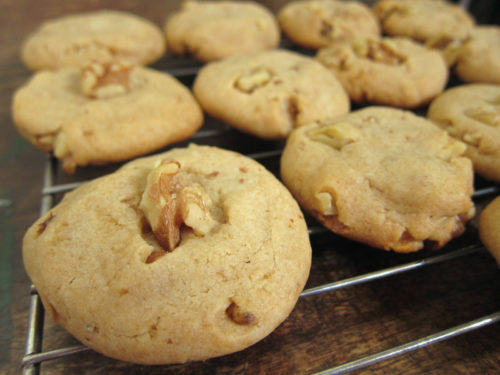 Love the sound of these cookies bursting with sweet honey flavor! Christina, the texture for these cookies is so wonderful, I’m sure you’ll enjoy them! Joanne, I never put honey in my yogurt – you’ve inspired me! Many years ago, before Greek yogurt was a thing, I visited Crete and every morning they gave me a big bowl of yogurt and honey for breakfast, and it may have been the best thing I ate there. I wonder, but can’t recall, whether that honey tasted of the local oregano that scented the seaside cliffs. Ah, yes, those familiar Greek cookies you are referring to are called “melomakarona.” The final step is to pour a simple syrup infused with honey, clove and cinnamon over the cookies. I’ve never made them myself (my mom always did), as I’m a big advocate of simpler recipes with optimum flavour results. I think your walnut and honey cookies offer the best of both worlds: tasty and easy! Haruspex, I’m so envious of your trip – I’ve always wanted to visit Greece!